Looking for the daily travel and professional tourism news portal site? PHP Scripts mall has developed a new Travel News Portal Script with advanced user-friendly customization and mobile-friendly development, this news portal script will help the professional journalism and world tourists to get daily updates about their favorite places in one site with gallery portfolio and blogs updates. This Travel Package News Script will make you feel the experience of using the world-class professional tourist journal, modern fashion travel magazine, travel blogging, clean and minimal news sites with rich snippets. The Tour and Travel News Portal Script is developed with flexible open source php source code where the customization is made simple and reliable for the users according to the user requirements. As the viewers enter into the system they can find the clear crystal display of the news portal templates with neatly structured plans and interlinking social networks. The viewers can find the places by entering the keyword or title of the news, where the required accurate answers are displayed with the help of our integrated advanced search box filter. 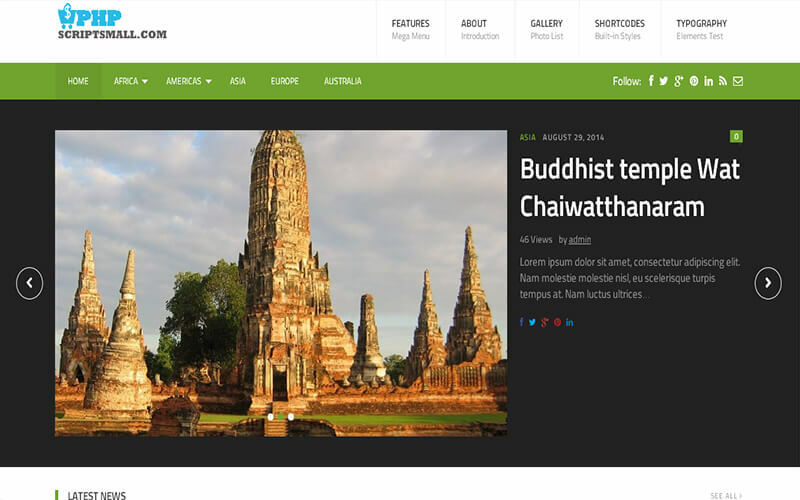 This PHP Travel Portal Script has the tourist place news with title, description, and images, then the user can view the news and can comment on the respective post to share their reading and news experience. In the footer of Travel Booking Website Script,the user can able to see the recent posts, popular posts, most viewed posts. This makes the users make easy and efficient searching for experiencing finding the news. The regular updates can also be sent to the user mail by signing up their mail id with our advanced featured newsletter. This Tour and Travel News Portal Script will help the new entrepreneurs to take down their own online professional news portal site at the affordable price with the clear managing user-friendly functionality. This Travel Package News Script has the admin portal where the site can be managed and controlled, the admin has the supreme power to grant permission for the user comment and feedbacks, the admin can modify the site title, menus, and widgets in simply by using our advanced resources tools. All the media and category are also managed by the admin. We are sure that this script will cover all the new authentic information, news, topics, events, interviews, guest articles, features and updates on the World Travel & Tourism with SEO-friendly customization. We have good mark experience in developing the web design and development, in creating cloning scripts, creating the brand-free site, we also offer 1-year technical support, 6 months free update services and 24×7 technical support team help for your solution. I really enjoy the clean code format. I was looking for a script that would allow me to focus on content, while offering multiple social and customizable options. This script looks great on the web and on mobile devices. The fast response time support is bonus. The documentation is strong and some of my feature requests are being considered which is highly appreciated. Thanks!!!!! It is an amazing script and has a lot of features. It is a wonderful script with every new feature. The technical team helped so much to modify this script according to my wish. They are good and cooperative. I recommend all to purchase this script because it has so many advantages in technical point of view, which is really great. This is the best thing I have bought on PHP Scripts Mall. Absolutely brilliant and they only give better. They are saved my lot of time. I love it!!!! !